Peugeot calls this the first of a new range of ‘special cars’, meant to add an edge of exclusiveness to a French marque better known for big-selling small cars. The company, celebrating its 200th anniversary as an industrial entity this year, is in the throes of a product re-think and a change of styling direction, and the RCZ is meant to show off these new aspirations. The idea has been to combine the proven but relatively simple mechanicals of the PSA transverse front-drive “platform 2” cars - which include the Peugeot 308 and Citroen C4 - with a much-admired two-plus-two coupe shape of the Peugeot RCZ concept unveiled at the Frankfurt show just over two years ago, to make a £20,000-plus model that poses the first French threat for years to the Audi TT and VW Scirocco. To go with the sporty shape, Peugeot offers three relatively powerful engines, two versions of the same 1598cc petrol turbo engine, producing 154 and 197bhp respectively, and a 1997cc turbo diesel that makes an impressive 161bhp. The diesel’s peak torque of 251lb ft (at 2000 rpm) easily exceeds the high-power petrol engine’s 203lb ft at 1800 rpm. There are two model lines, a mid-spec Sport and a high-spec GT, both of which can be ordered with any engine. Only the low-powered petrol unit is offered with a six-speed automatic; the others come only with a six-speed manual stick-shift. Prices for the RCZ, which goes on sale late in May (though the 197bhp version will be a couple of months later) range between £20,450 for the lower-powered petrol Sport, to £25,050 for the GT THP200, the model tested here. Production is handled by Magna Steyr in Austria, and around 20 per cent of the 15,000-a-year production (50 per cent diesel/petrol) is earmarked for the UK. Short answer: it’s another good Peugeot. After some lacklustre models, the company has recently started launching good ones: notably the decent 3008 crossover and the impressive 5008 MPV. The RCZ is instantly impressive for its sheer road presence. RCZ project manager Marjorie D’huillier says every effort was made to capture the show car’s looks in production, and it has worked. The RCZ looks much better, much more exotic with its forward cabin, metallic cabin rails and race-bred double-bubble roof, than any rival. The interior isn’t quite so special. It’s oka: a logical layout and bright work make it seem more upmarket than previous Peugeots, but there are few surprises. However, the cockpit is roomy in front, and access is easy through big doors. Peugeot makes a big issue of the car’s overall practicality - pointing also to the impressive boot which practically doubles in size when you fold down the (very) occasional rear seats. Less impressive are the ultra-thick windscreen pillars and the somewhat oppressive black headlining in some versions. On the road, it’s a fun to drive car, with neat handling, plenty of grip (our car had the optional 19-inch wheels running 235/40 tyres) and nice steering. But it’s not really a car for the hard-core enthusiast. It’ll always understeer when pressed, and there’s a shade more body roll than you expect, to signal the fact that the spring rates are only mildly sporty, leaving room for a fairly supple ride through the suburbs. Our test car’s impression of good body rigidity was slightly spoiled by some tyre/suspension bump-thump which you certainly wouldn’t find in a Scirocco or TT. The GT THP200 we drove felt brisk, but not honest-to-God quick. The engine pulls admirably from around 2200rpm, gaining thrust as you pass 4500 (en route to a 6500 rpm redline and a 6700 rev-limiter) but the hefty kerb weight is a limiting factor. The top speed of 146mph reflects the decent aerodynamics and small frontal area (a small spoiler deploys automatically to a low, then a higher, position as speed rises). The so-so 0-62 mph time of 7.5 seconds shows how the willing engine must fight the weight. Still, this a brisk and enjoyable car, and has a feeling of freshness about it just because Peugeot hasn’t built such a car for so long. Yes, if you enjoy driving and want to impress people. The RCZ is fun, but most of all it looks far better on the road than either Scirocco or TT. It’s comfortable, too. The German cars will edge any contest that involves driving quality; each has an almost Porsche-like single-mindedness. But the RCZ is different, a practical car that is fun to drive, and far prettier than anything you can get at this price. "The RCZ is fun, but most of all it looks far better on the road than either Scirocco or TT." I will second that, the 2nd gen TT is a watered down, pale copy of the original and the Scirocco is a strange beast and just not pretty. Well done Peugeot, making desirable cars again. Wow. Looks like Peugeot are well and truly on the comeback trail. 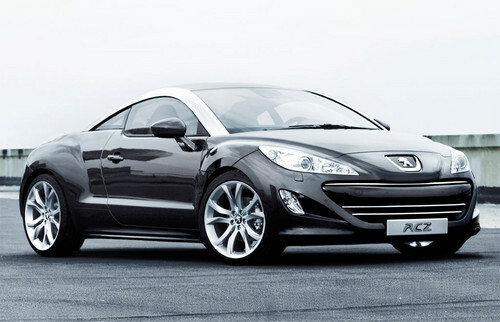 People were waiting to see what the RCZ verdict would be, and I think this confirms Peugeot's upcoming renaissance. Personally, I think that gaping mouth ruins the front end. Reminds me of the VW Karmann Ghia from some angles - which is no bad thing. Looks really good and if it stays working properly Peugeot will have a winner. "race-bred double-bubble roof". Who are you kidding. Tacky gimmick more like. The rest of it doesn't look bad, but is clearly a TT copy the like of which the Chinese would be proud. The interior looks horrible too. Plastic fantastic. Complete and utter rip off the original Audi TT. Absolutely shameless. Save another £2k, or negotiate it direct off a TT and have the real thing? I think it looks rather nice, but it is a heavy beasty! Nice car, dynamically not at the top of the class, benefitting from from some decent engines (are the 1.6 engines BMW/Mini units...?) but suffering from a weight problem. Solid dynamics, good looks and maybe some confidence for the general public that there's better to come from Peugeot. Personally I think the 3008 is a very ugly car, and while the 5008 is a good effort, Citroen already do it better - still PSA products but obviously not Pugs. If RCZ is a copy of the TT, then Scarlett Johansson is a copy of a pig. And if this looks horrible... No, it's not worth it.